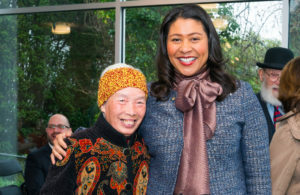 On January 15, Mayor London Breed and Supervisor Stefani joined with Mercy Housing residents to celebrate the rededication of 2698 California and JFK Towers in San Francisco. Renovation of these two affordable housing communities marked the completion of upgrades to all six properties that Mercy Housing and partners acquired in 2015 from the City of San Francisco Housing Authority as a part of HUD’s Rental Assistance Demonstration (RAD) program. Together, these communities provide 138 homes for low-income seniors. 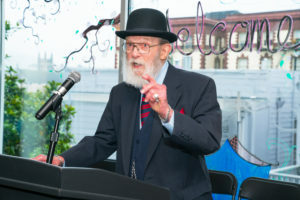 The rededication event was held in JFK Towers’ large community room which now has floor-to-ceiling windows looking out over a verdant, rain-drenched garden. This lush view is one of the many new improvements Mercy Housing, John Stewart Co and Japanese American Religious Foundation have made to the building whose community room used to be small and windowless, furnished with outmoded folding tables. Paulett Taggart, the renovation architect, reworked the entryway and shared spaces, creating more light-filled places for residents to gather. The exterior of the building underwent extensive structural repairs but maintained its distinctive brightly-colored doors overlooking the courtyard. 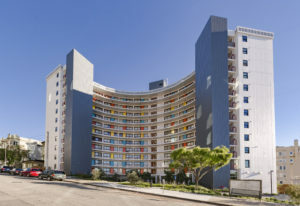 Guests at the event were then able to walk down the hill from JFK Towers to tour 2698 California apartments where architect Barcelon Jang had also completely redesigned the community spaces, making them into warm and welcoming rooms with lots of natural light. If you aren’t a building contractor, you probably don’t have an interest in hearing about all the seismic retrofitting, safety upgrades, and energy efficiencies that were added to each building. Suffice it to say that the seniors who live here are now much more comfortable. After Supervisor Stefani, the Mayor, and other dignitaries spoke, the last speech of the morning was given by 93-year old resident John who has lived in the building for a very long time. He shared with the audience how he is charmed by the fact that Mercy Housing staff all address him as “Mr. John” as a sign of respect. To his delight, even the construction workers greeted him as “Mr. John” when they saw him in the lobby or met him in the elevator. His appreciation of this simple gesture indicates a subtle shift in the culture of this community since Mercy Housing began operating it. After the event concluded, other residents echoed Mr. John’s sentiments about feeling seen and respected. Over coffee and pastries, they proudly introduced the guests and presenters to their neighbors and friends living in the community. We are witnessing firsthand how these structural renovations not only physically transformed the buildings, but also have had a tangible effect on the community of people who live in them.